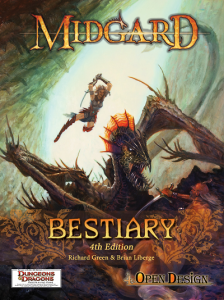 We’ve hit the first stretch goal for the Midgard Bestiary for 4th Edition Kickstarter! Thanks go to everyone who has joined us. To celebrate, take a look at the zmey, which designer Brian Liberge tackles in our latest design diary. At the end of the alphabet comes the zmey. 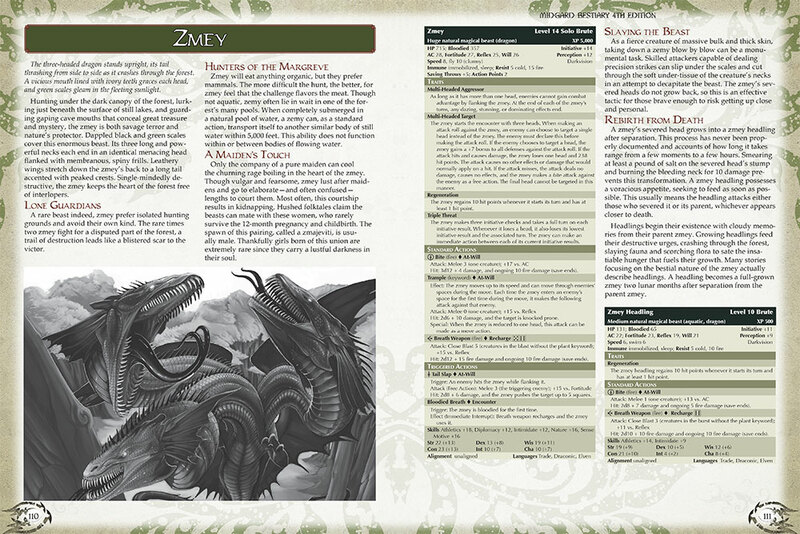 Originally found within the tales of the Old Margreve, the zmey is a creature of legend. These massive forest guardians have three dragonlike heads and a powerful tail, and they breathe fire down on their foes. It was a natural choice to make it a solo creature. Solo creatures that are far too easy for a party to defeat have also become stuff of legend, so we had to make sure our own would stand up to assault without being too powerful to provide a fair challenge. We continually tweaked it from inception to the very end of playtesting. 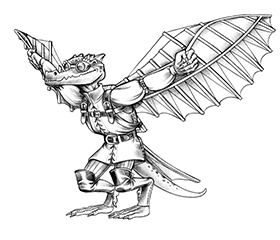 I began reading Kobold Quarterly and its print products only a couple of years ago, so I missed much of the earlier work until recently. The first version of the zmey was based solely on the descriptions from forum users. In a way, this was excellent because my first vision of the creature was based on its most memorable elements from players who had fought it. A lot can get lost in interpretation, though. I eventually got my hands on the version as it was originally. I adapted the design to make sure I stayed true to the history of the zmey. This version allowed you to target a head and sunder it like a weapon. There are no rules for sundering in 4th Edition, but we wanted to retain the feel of this mechanic. Striking at the heads needed to be risky, and it needed to be distinct from the experience of fighting a hydra. An early feature allowed the zmey to attack any creature that missed with a melee attack. Combining this with the increased defenses when targeting a head proved to be a little too deadly in actual play. The final result is a hardened foe that viciously cuts into the party at the start of combat. Each head represents a turn in combat, with a new chance to trample the group or recharge its breath weapon. The party will need to choose its tactics wisely. Will they slowly hack away and risk its continued attacks, or target the well-armored necks? Choose the latter and face a panicked rampage if you survive long enough to reduce the beast to a single remaining head. If you haven’t yet kicked in, please do consider doing so over on the Kickstarter site! 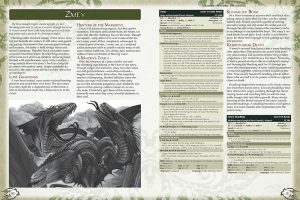 Now even more 4th Edition monsters await inclusion in your game. Do the severed heads still turn into Headlings? If they do, are they minions or new fully stated monsters? Does the Zemy still get to blast a character from three different directions? I’ve always liked that part. Severed heads can still spawn Headlings if not treated properly. Each Headling is a Brute in its own right. Each Zmey head can use the breath weapon, which is a sizeable blast.